The zombies from the Ice Legion will be gone really soon. Fortnite: Battle Royale players will no longer see the Ice Storm challenges tomorrow. At 5am CT, an in-game timer appeared today to show that there are 21 hours left to complete the 13 Ice Storm challenges that were added to the game on Jan. 19. It’s very likely that everything else that came with the challenges will be gone too, including the modified Ice Storm game modes and map changes. Related: What is Fortnite’s Snowfall skin? This means players who want the event-exclusive rewards, like the Blue Metallic Wrap and the Winter Thorn Glider, have a few hours to finish all of the zombie-filled tasks. After the Ice Storm challenges are over, these two cosmetic items might be unavailable for a very long time. If they ever return to the Item Shop, players who want them will have to spend V-Bucks. When the Ice Storm event is over, we’ll probably see Ice Storm Solo, Duos, and Squads replaced by the standard modes. When this happens, the zombie-like monsters from the Ice Legion will be removed from the game along with the Ice Shards, Golden Ice Brutes, and everything related to them. 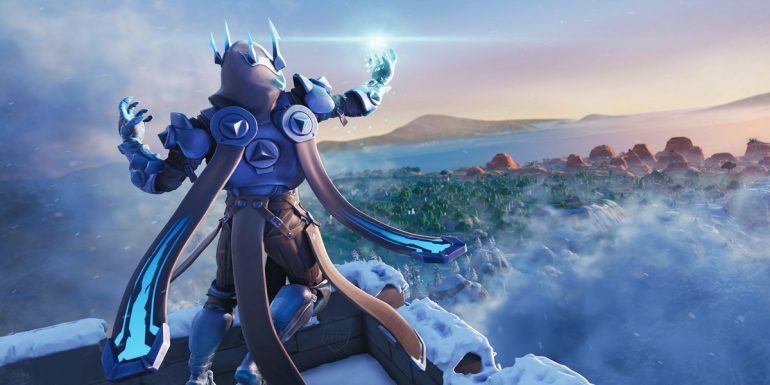 Developer Epic Games has extended the duration of events like Ice Storm in the past. In December, Epic’s holiday event, 14 Days of Fortnite, ended up lasting about 22 days in total since the developer brought it back a few weeks after it first ended due to a miscommunication about the end date. But with Ice Storm, it’s unlikely Epic will do the same. All challenges have been unlocked for a few days and there was no apparent miscommunication about its end date. Also, if Ice Storm is tied with the end of season seven, the company will probably force itself to put an end to it so that it can move on with the lore. Players who want to complete the Ice Storm challenges or annihilate some Ice Legion zombies have the entire day to do so. Tomorrow, though, they might be gone for good.